Bordogni's wonderful vocalises (wordless vocal studies) have long been adopted as melodious études by brass players who wish to reap the benefit of playing repertoire 'in the singing style'. This volume is like no other Bordogni publication and is the only complete collection of Bordogni’s vocalises currently available in treble clef for trumpet, cornet, tenor horn, euphonium, baritone, or brass band trombone and Eb bass tuba. The book contains all 120 solos and 12 duets along with 6 pages of detailed background information including an interpretation guide, and a 3 page index of first lines to help navigate this substantial collection of pieces. The music has been painstakingly transcribed from Bordogni’s original publications by Gary Spolding with the choice of keys and piece order influenced by Joannès Rochut. The book is practical to use with page turns minimised and placed at appropriate points in the music, the duets use an innovative layout where one player reads the left hand page and the other the right, and the whole volume is comb bound to ensure it opens flat on a music stand. 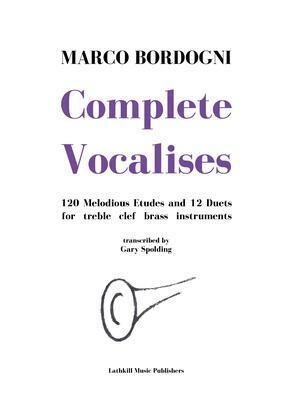 We consider Complete Vocalises by Marco Bordogni to be essential for any brass player as a collection of challenging studies, an extension to ‘The Art of Phrasing’ at the back of the Arban, and a source of concert repertoire. Postage is £3.30 to addresses in the UK. Enquire for rest of the world. Not available as a pdf.